Survivor Diet Challenge: Day 20 - Nice Striped Bass - Finally! I started this Saturday morning very early - 4:50 am wake up. 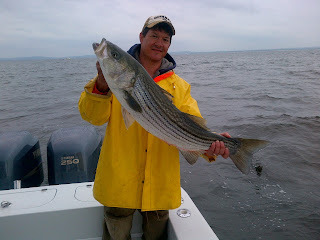 Brad was kind enough to set up a fishing trip with George the Fisherman and his buddy Joe and the four of us took an early morning ride out to Raritan Bay to get some stripers. George is an old salt from Monmouth Beach - Debbie and her mom know him from growing up right around the corner and he's ALWAYS been the fishing guru in the area. So it was a real treat to go out on his boat and learn a few things from someone who has been doing it a very long time. The weather forecast called for rain and thunderstorms throughout the day and I was a little skeptical about going in miserable conditions. However, I bundled up and wore my waders and rain gear and I was perfectly fine - even when it was raining on us from time to time. 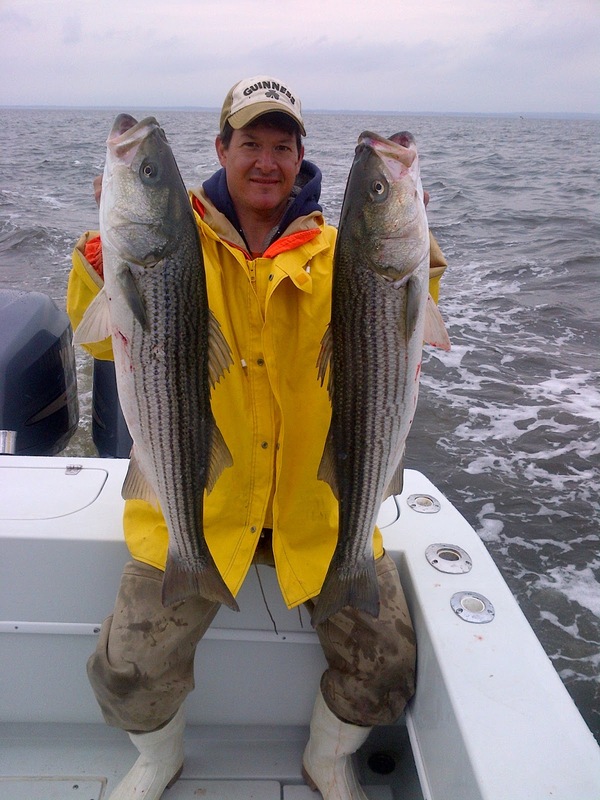 It was a fairly slow start but we managed to get several nice striped bass using bunker spoons and a wire line method of trolling. We put two rods out the sides of the boat with 150 ft of wire line and bunker spoons attached to about a 6 ft leader of 80lb mono and a snap swivel. Pretty simple set up - but very effective. Before long we had our boat limit of eight fish and we headed in. Some other things to note - our speed was about 3.5-4.5 knots, depth was about 26-34 ft and if it was any deeper then a trolling weight would have been used between the wire and the leader to get the spoon down deeper. 150 ft of wire line gets the spoons down about 15 ft and for every 5 ounces of lead used you can get another 5 ft down - so says George. We got back before noon and now I have plenty of fish for the upcoming week. On my way home I stopped in at Pat's house to get some ice and to give him a report. We also tried to make some plans for fluke season opening day next Saturday. The fish are now on ice and in the cooler waiting to be cleaned tomorrow. It's going to be sushi time! Looking forward to a little fresh sushi after all the smoked fish jerky I have been eating. I also have some nice baby arugula greens coming up in the garden to add to my sushi rolls. I am looking forward to the next couple days of eating. I have been really eating a lot of figs - at this rate my fig ration will be gone very quickly. My will power is not very good at the moment. They are just so delicious compared to the other foods available. When I got home I noticed that one of my traps had sprung in the yard! I quickly noticed that there was another big hole chewed through the front of the plastic container. Another squirrel caught - and another squirrel escaped. I just wasn't there to witness, film or capture the moment - so although my traps have both now proved to be primitive and proficient, I am not able to claim a 'Small Animal Reward' yet. Not until I actually contain an animal long enough for a photo or live release. No bunnies yet. We went to Lavallette for Mother's Day and I brought a SDC meal of bluefish jerky (the very last three pieces), one egg, some baby arugula and two dried figs. I was content eating my meal only slightly tempted by the Caesar Salad - Oh, and the bread! The bread and butter looked so good! I just kept looking forward a couple days when my week 3 reward of flour and yeast will be coming my way. I am going to try to make some of the best damn breads with these basic ingredients next week. Since 1893 it has stood, a beacon warning mariners away from the treacherous shallows of Old Orchard Shoal off Great Kills Beach. For 119 years the light emanating faithfully from a distinctive white tower perched on a rock in New York City's lower harbor, never failed. It weathered every storm. Now the Old Orchard Shoal Light is gone, swept away, a victim of historic Hurricane Sandy as the tempest roared across Staten Island on October 30.